The German foundation that owns the patent to venerable “old” music format MP3 recently announced that they would let their patent lapse. MP3 blew audio file-sharing wide open throughout the 1990s and early 2000s. The combination of data compression, file size, and retained audio quality ensured the audio format shot to notoriety on either side of the piracy argument. 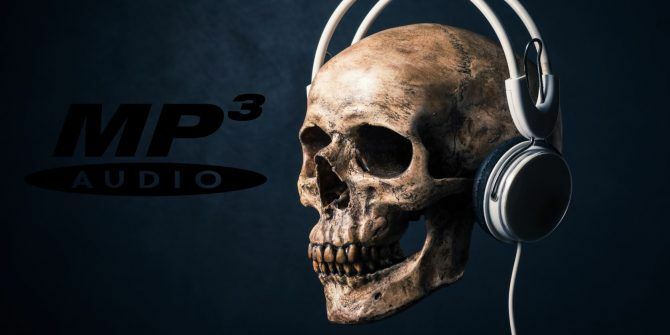 The headlines read “MP3 Is Dead,” but any real audiophile knows a true death is highly unlikely. Nonetheless, it is time to look at the history of a world renowned audio format, and what may come in the near future. Exactly How Does MP3 Work? Depending on the age and abuse your ears have sustained, your auditory frequency range lies between 20 Hz and 20,000 Hz. Furthermore, our ears are most sensitive to sound frequencies between 2 kHz and 5 kHz. Our hearing is also limited by our ability to filter and process audio signals as they arrive. Frequency masking — the key to MP3 compression — relies on the brain’s inability to distinguish between certain signals. Imagine we have two sounds. They have very similar frequencies (e.g. 200 Hz and 210 Hz) but they’re played at different volumes. The weaker sound is audible on its own, but the stronger is distinguishable only if they’re played simultaneously. The process of covering one frequency with another close frequency is called “masking.” Frequency masking works efficiently at the top and bottom of the audio spectrum. Let’s presume we’re ripping a CD to your computer. 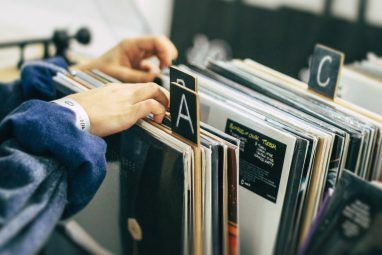 The music on the CD is sampled 5 Tips for Optimizing Audio File Sizes 5 Tips for Optimizing Audio File Sizes If you've ever wanted to reduce the size of an audio file but weren't sure how to do that without impacting the quality of the recording, here's everything you need to know. Read More 44,100 times per second (44.1 kHz). The samples are 2 bytes long (1 byte is 16 bits). MP3 supports several rates, but typically uses the CD-standard 44.1 kHz. An individual MP3 file consists of MP3 frames, featuring a header and data block. Each frame contains 1,152 samples. Technically, it is two “granules” of 576 samples. The samples are run through a filter that further divides the sound into a specific set of 32 frequency ranges. The MP3 algorithm then further divides those 32 frequency bands by a factor of 18, creating 576 even smaller bands. Each band contains 1/576th of the frequency range of the original sample (when we started ripping the CD to your computer). At this stage, two complex mathematical algorithms do their work: the Modified Discrete Cosine Transform (MDCT) and Fast Fourier Transforms (FFT). Each performs a different process on the broken-down source material. FFTs analyze each frequency band for sounds that can be easily masked, making sure that the frequency masking preserves vital sounds in the track. The samples are then sorted, and passed on to the MDCT. MDCT turns each band into a set of spectral values. Spectral values more accurately represent the way our hearing interprets audio. Therefore, many compressed audio encoders use spectral values to remove audio data. Once the spectral information and the analysis of the granule are complete, the actual compression process begins How Audio Compression Works, and Can You Really Tell the Difference? How Audio Compression Works, and Can You Really Tell the Difference? In this article, we'll take a look at how music compression works, and whether it has any real effect on how your music actually sounds. Read More . Do you remember your first MP3 player? I was lucky enough to have an original iPod — until a man with a knife liberated it from my possession. MiniDiscs were way cooler, anyway. Regardless, by the time the original iPod rapidly escalated the desire for MP3s (in 2001), the format was already eight years old. Furthermore, MP3 was already making waves on the internet and other portable digital music devices. Where Did MP3 Come From? MP3 was a Moving Picture Experts Group (MPEG) design, as part of its original MPEG-1 audio and video compression standard. MP3 is an abbreviation of MPEG-1 Audio Layer III, approved for use in 1991 and finally published in 1993. The idea behind MP3 is pretty cool. The MP3 algorithm takes advantage of the perceptual limitations of human hearing, referred to as auditory masking. Auditory masking occurs when the perception of one sound is affected by the presence of another. Furthermore, every song contains audio elements imperceptible to the overall listening experience. Manfred R. Schroeder first proposed a psychoacoustic masking codec in 1979. However, it wasn’t until the formation of the MPEG (as a subcommittee of the ISO/IEC) in 1988 that a concerted initiative for a global standard began. There is another important name in the history of MP3: Karlheinz Brandenburg. Brandenburg began working on digital music compression in the 1980s, completing his doctoral thesis in 1989. The various modes of compression he had worked on How Does File Compression Work? How Does File Compression Work? File compression is at the core of how the modern web works, one could argue, because it allows us to share files that would otherwise take too long to transfer. But how does it work? Read More found limitations in both available technologies at the time, as well as the design of early encoding processes. He, along with other founding MPEG members, realized that only a new system would suffice. In 1990, Brandenburg became an assistant professor at the University of Erlangen-Nuremberg. He continued his work on compression with the Fraunhofer Society (he would eventually join Fraunhofer 1993). Brandenburg used the song “Tom’s Diner” by Suzanne Vega to refine the compression algorithm, listening to it again and again, to ensure his tinkering didn’t adversely affect the recording of Vega’s voice. MP3 sat in the doldrums for a couple of years after its official release, the codec deemed “too complicated” for widespread use. However, in 1997, things changed — fast. First, an “Australian student” bought professional encoding software l3enc from a German company. He reversed engineered the software, recompiled it, and uploaded it to a U.S. university FTP with a README file saying, “This is freeware thanks to Fraunhofer.” This small act instantly changed access to MP3 encoding and decoding. Suddenly, sticking a CD into your computer rendered high-quality audio in tiny file sizes. Second, Nullsoft released the venerable Winamp audio player. MP3s ripped from a CD could be easily played on a computer. At the same time, the internet had spread into millions of homes around the world. Millions of HDDs were filling with MP3s 4 Fantastic Tools to Manage Your Massive MP3 Collection 4 Fantastic Tools to Manage Your Massive MP3 Collection Music library management can be an entirely frustrating experience, especially if you have years of unorganized music waiting to be sorted and labeled properly. Poor music library management will come back and bite you later... Read More , and the format became the preferred audio file sharing format for early peer-to-peer file sharing services, such as Napster, Gnutella, and eDonkey (Gnutella was another Nullsoft project). Musical piracy was alive and rampant and was in no small part aided by the rise of MP3. In a further boon to the established audio industry, portable MP3 players appeared. In the early 1990s, The Fraunhofer Institute had tried and failed to create a marketable MP3 player. It was simply too early for widespread adoption. It needed the aforementioned combination of file sharing, internet proliferation, and ripping software to give portable MP3 players momentum. South Korean company, Elger Labs, introduced the $250 MPMAN F10, complete with a whopping 32 MB memory. It wasn’t the mindblowing spark to the industry as we know it. That accolade rests with the Diamond Rio PMP300, also featuring 32 MB. The success of the Diamond Rio attracted unwanted attention. The Recording Industry Association of America (RIAA) sued Diamond Multimedia Systems (the manufacturer) — and lost. However, the RIAA correctly assumed that this was the beginning of endemic musical piracy, that continues to this day. Well, a little-known device called the iPod hit the markets, completely legitimizing MP3 as the de facto audio format of the time, and the RIAA began its (ongoing) crusade against pirates around the globe. Why Is MP3 Dying Then? The Fraunhofer Institute owned the MP3 patent. On April 23, 2017, their remaining patents expired. Therefore, Fraunhofer can no longer issue new MP3 licenses. We’ve explained exactly what is going on How Will the "Death of MP3" Affect You? How Will the "Death of MP3" Affect You? You may have seen the headlines suggesting the MP3 is dead. Thankfully, this is nonsense. So what's the truth behind the headlines and how will the real story affect you? Read More with these “apocalyptic” headlines, as well as how it will affect you. Want the TL;DR? MP3 isn’t dead and it isn’t going anywhere. One of the main reasons Fraunhofer gave for letting go of MP3 was age. It can no longer compete with its newer and shinier codec-cousins. Their suggestion? Use Advanced Audio Coding (AAC) instead. Coincidentally, Fraunhofer also hold the (ongoing) patent for AAC, so we’ve got a few MP3 alternatives you can choose from, below. Your MP3 collection won’t suddenly combust, just as existing encoders and decoders will continue to produce MP3 files. That said, MP3 is a little dated now. There are several free alternative audio formats The 10 Most Common Audio Formats: Which One Should You Use? The 10 Most Common Audio Formats: Which One Should You Use? 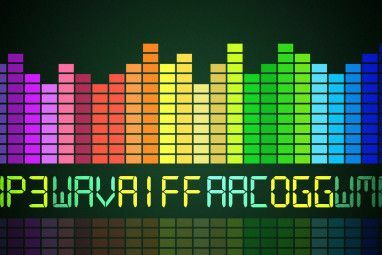 You know about MP3, but what about AAC, FLAC, OGG, or WMA? Why do so many audio file formats exist? Here's a breakdown. Read More you can use to store your digital music now. AAC — Advanced Audio Coding, as mentioned above, is the successor to MP3. The only problem is that the format in itself is now looking a little dated. Nonetheless, AAC generally achieves better audio fidelity than MP3, with similar bitrates and file sizes. AAC is also a lossy format. Ogg Vorbis — Vorbis format, commonly used in conjunction with the Ogg container format. It’s the better, slightly younger, open source cousin to MP3. Despite Ogg featuring better compression, higher bit-rates, and generally better audio quality, Ogg never took off in the same manner as MP3 due to a lack of supported devices. Ogg is also a lossy format. FLAC — The Free Lossless Audio Codec is the most popular lossless audio codec format. Why? FLAC offers an exact audio copy of the source material, at half the size of a traditional CD. The sounds most affected by MP3 (e.g. guitars, cymbals, reverb, etc.) remain crisp despite being significantly compressed. FLAC is a lossless format. You have nothing to worry about. You can continue ripping to MP3, and your devices will continue to play your music. In the long-term, it will be worth at least investigating a newer audio format for your collection. Compression techniques will advance 4 Easy and Effective Ways to Compress Large Audio Files 4 Easy and Effective Ways to Compress Large Audio Files Compressing audio files to reduce their size is an essential skill. Here are four tools that'll help you reduce large files down to a more manageable size. 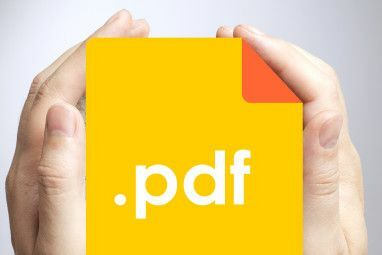 Read More and file sizes of exact copies will decrease. In addition, it is worth considering storage capacity. When the first portable MP3 players arrived with 32 MB storage 7 Technologies That Came and Went in the Last 15 Years 7 Technologies That Came and Went in the Last 15 Years Remember the Walkman? Sony’s portable tape player revolutionized the music industry. Read More , it was cool, but evidently not enough. The largest storage for an iPod Classic was 160 GB. That could be bumped with a custom storage upgrade Breathe New Life Into Your Classic Old iPod With These Top Tips Breathe New Life Into Your Classic Old iPod With These Top Tips We've all done it. You buy a shiny new piece of kit at an exorbitant price, and two years later it's in the back of a drawer collecting dust — alongside your old iPod. Read More to a whopping 240 GB — well over 1,000,000 individual MP3 tracks. The point being that as storage size increases and physical size decreases, we can do more with less. Finally, the internet continues to change how we listen to music. I used to pirate music because I couldn’t afford to pay $12–20 for every new album that came out. Now I’ve got a Spotify family plan account Save on Premium Subscriptions With These 9 Shareable Accounts Save on Premium Subscriptions With These 9 Shareable Accounts Premium subscription services are great, but the costs add up fast. Here are 9 services you can share to get the most for your money. Read More with access to millions of tracks and an Amazon Prime account with millions more. The only thing limiting me is my internet connection, and even then, they both have options for offline downloads in high-quality formats. It isn’t as important as it once was, but MP3 ain’t dead. What is your preferred audio format? Do you need the crisp reality of lossless? Or extreme compression of a lossy format? Has your music usage changed since streaming services became widespread? Leave me a line in the comments, and I’ll get back to you. Explore more about: Audio Converter, File Compression, MP3. I remember my first Diamond Rio, subsequent resistance to the Apple iPOD and my napster account. I must have ripped 2,000 CD's to MP3 back in the day and burned albums from my MP3 downloads to play in my incredibly new, CD Player! LOL. How things change. We sat in the attic playing MP3 and WAV files and arguing which one sounded better. There is also opus from the vp9 codec family. But I guess not many like this format. When patents expire for other things, they turn "open", and anyone can access or reverse engineer for free. When MP3 patents expire, the technology will die?